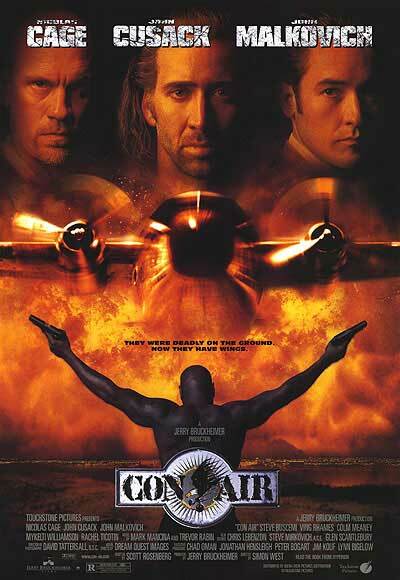 In the pantheon of ridiculous, over-the-top 90s action films with quotable dialogue, Con Air (1997) ranks very high. Cage actually feels somewhat subdued in this one, but considering the rest of the ensemble, who all fire on every cylinder, it's not surprising. This is the kind of "dumb" slick action flick I like - one that realizes that the dialogue and characters are just as important as the explosions. Definitely a fun film I often catch myself watching when it's on TBS or whatever. Steve Buscemi played a really believable creep. Malkovich was definitely believable as well. I feel like Cage as the same character from Gone in 60 Seconds. 'Don't bother me but I'm the hero'. I haven't seen any of the GI60S films but Cage definitely has certain types he plays (i.e. different levels of crazy), depending on the film.